Canned food is expensive since it contains water. The food tends to spoil faster than dry foods. Dry food can be put back into the packet if not eaten. Cat’s breath may smell bad as a result of eating too much wet food. Stools might be softer. However since cats require high intakes of water, cats may benefit from eating wet food with a high water intake in them. Dry foods does not contain water and the buildup of tartar maybe considerably less. The cats tend to crunch on the kibble which will result in strong and healthy teeth. Dry food is less expensive and does not smell as much as wet food. Dry food does not spoil quickly and can be kept for days. Stools will be firmer. Should A Cat Be Only Given Vegetarian Diets Or Vegan Diets? Cats are carnivorous by nature. Cats in the wild are used to preying on flesh foods and have a digestive system that can absorb flesh foods which include eating fish and meat. Domestic cats can easily adapt to a vegan diet. Their diet should generally include animal tissue for long term good health. Cats also require amino acids such as taurine and arginine. These acids are not available in natural vegetarian diets except some concentrations in pumpkin seeds and certain sources of plant. This will not do any good to the cat. When there is no taurine in the food it can lead to blindness and eventually death. There is another nutrient similar to taurine known as arachidonic also found in animal tissues. Taurine is found in fish, little birds and rodents all food that cats eat mostly by preying. Cats cannot survive on a vegetarian diet or vegan diet alone, unless the owner provides a supplement which consists of taurine in the food. Dog food should not be given to cats. It is most unsuitable and lacks the right balance of nutrients. Cats require more protein and fat than dogs, and will result in its health being seriously jeopardized if fed with dog food for an extended period of time. Dogs do not need taurine since they can make it themselves. Cats require taurine or else will perish. Cats also require lots of protein unlike dogs. Dogs can make their own vitamin but cats cannot do so. Cats need vitamin A and C and it can be supplied only through other sources. Cats also require a fatty acid that is imperative that is not found in dog food known as arachidonic acid. Can Human Food Be Given to Cats? There are some foods that can be harmful when eaten by cats. A pet owner must not randomly feed cat human food. For example, a cat must never be fed onions, root vegetables and garlic. Both garlic and onion can result in anemia in cats called Heinz Body Anemia. It contains a substance that destroys red blood cells which results in this type of anemia. Garlic also contains this substance at a lesser level. Cats should not be fed chocolates since it can be toxic. Theobramine is the toxic substance in chocolate. 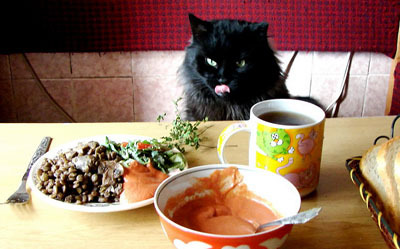 Other common human food beverages such as coffee and tea should also be avoided in a cat’s diet. Potatoes and raw tomatoes must also be refrained from being given to a cat. These foods contain a bitter and deadly poison known as alkaloid which can result in terrible gastrointestinal symptoms. Grapes and raisins must also be avoided. There are a few unknown toxics in grapes and raisins and mushrooms can become fatal. A Science diet is healthy to be included in a cat diet. This food is expensive but easy to digest since it comes in low bulk. This is the best food for cats it also results in a cat having a silky coat and good fur. Cats can be given milk but cow’s milk must be avoided. Cream can be given instead of milk since it contains less lactose and will satisfy the cat more than milk. Hi I recently got a cat that is Siamese, I was told not to give them food with corn in it. I’m on a fixed income and the grain dry cat food is running around $10.00 per bag. What is the best thing to feed this breed of cat. I did purchase Rachel Ray’s cat food and mix it with the ND that was given to me when I received the cat. Could you please give me cost effective products. I will try to continue to give her better food but when money is funny want to know what is a good substitute?